London-based Nadja von Massow combines her passion for jazz with a background in the world of marketing, digital strategy and web design to support artists in areas such as website development, social media, email strategy and promo materials. We met about 7 years ago when I was booking a project featuring Joe Locke – who she manages – and I got to see her design skills in action. Through her company, Nadworks, she has worked in various creative capacities with a whole host of international artists and record labels, helping them maximise their potential as gigging musicians. In my opinion, winning over a promoter or journalist as a jazz musician can sometimes start way before they hear your music. You have to grab their attention through whatever means possible – from artwork and social media to press copy and quotes – so they actually take notice and get to the music! 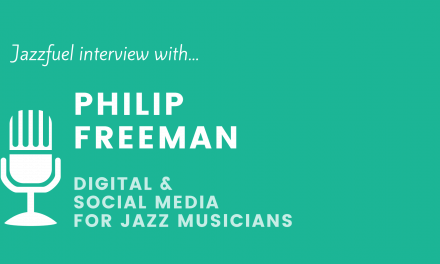 I love hearing what people with skills in the ‘digital’ area have to say – especially when they spend a large part of their time actually working with jazz musicians. Nadja certainly didn’t disappoint, in what is possibly the most detailed Jazzfuel Q&A to date. No editing down here because it is all relevant, in-depth and very useful! You have a strong background in web development. What are 3 key ingredients of an effective jazz musician website, in your opinion? First and most importantly, the website must be mobile responsive. While I would expect that from anything digital these days, stats are showing me that musicians’ web content is particularly often accessed on smaller devices. Making that experience as smooth and engaging as possible is therefore vital. Next is keeping the homepage fresh. All too often artists – or their negligent web masters – treat their sites like static calling cards, ignoring the need for regular updates. Visitors are only coming back if they see new content being added every so often. Plus, Google’s search algorithm loves “living” websites, rewarding them with high rankings and equally frequent search listing reviews. My third point is the need to allow fans to easily interact with the artist through the website by opening the digital channel’s capabilities to increase reach and grow an audience database. This can happen in a huge variety of ways, the most obvious being clear sign-postings to the artist’s social media presence. But I am also a great advocate of collecting data: through mailing list subscriptions, contact forms to invite questions (and return answers! ), and by enabling visitors to leave comments or one-click emotive reactions to content. In essence, a successful website should never be a one way street of self promotion. It must always be an exchange of value. You are working with multiple artists and labels; How do you manage the various social media channels. The long answer is possibly rather disappointing. I strongly believe that – to a certain extend – a working musician today needs to embrace social media and the importance of direct personal engagement with fans, followers, supporters and even the media. There are tools that help manage the potpourri of different platforms (such as Hootsuite, Tweetdeck, Sproutsocial), but the biggest learning curve for most of my clients is the realisation that audiences want to see your personality in the social space. People dislike being sold to or bombarded with impersonal management or label generated marketing speak. They want to feel that they engage with the artist themselves. For that to be genuine, a musician has to at least occasionally get active and share updates and anecdotes. A great example is Christian McBride. Not only is he a busy A-list Jazz Musician, but he also tweets, posts and instragrams personally. And it adds to his popularity and shows his genuine approachability, resulting in extra audience reach. Joe Locke is an incredible communicator and has taken to social media like a mallet to a vibes bar. Whenever his time allows, he reaches out directly – especially on Facebook – and it shows in his follower and subscriber numbers. In a digital consulting capacity, I do support all of my clients in finding “their” channels and getting to use them right. For example, Mike Lindup loves Twitter and Instagram. Tommy Smith and the SNJO use Facebook brilliantly. And what I indeed manage for a few of my clients is social assets and content creation: videos, gif animations, graphics, headers, slide shows etc. That’s providing the key ingredients to be shared for the odd promotional post that is necessary, or to emphasise the artist’s personality, music, concert dates etc. When planning strategy for an upcoming tour or release with an artist, what have you found are the best ways making sure the plan is put into practice? Timely and reliable communication is absolutely essential. Getting back to people straight away – even just with a brief note – is without question one of the most important aspects of my way of working. This is particularly crucial since half of my clients are based in the USA. I urge any self-managing artist to keep an eye on their communication discipline. Having a good reputation in that department can make or break an engagement. True to the idea of “allowing the artist to focus on the music”, I work collaboratively with him or her to a point of knowing exactly what’s needed to represent them and their project in the best possible way. Then I fly solo and compile the project plan, working systematically backwards from the event date – be it for an album drop, tour start or large single event. Some basic experience comes in handy in terms of knowing when certain things need to happen within the timeline. But my general rule is to start as early as possible and expect unforeseen delays along the way. As I’m not a booking agent, my biggest difficulty is co-ordinate different venues’ and promoters’ booking cycles and lead times. That can really mess up even the best laid plan. So, diligent contact management via an eCRM tool such as Hubspot have eased that pain a little. Besides Hubspot, I utilise a number of integrated applications such as G’Suite and Egnyte. Larger file volumes are sitting on a secure AWS (Amazon Web Sevices) location, which is handy for streaming content or multi media file sharing. The ongoing third party collaboration often depends on the methods preferred by all involved. For my work with Joe Locke, who I manage on a 360° basis, I connect with his label, publicist and booking agent mostly by email. For tour management, the good old tidy tour book is still the best method to please all band members. In terms of connecting with fans via email, do you try to create content on a regular basis or just reach out as-and-when there's a tour or new album. There’s no value in desperate regularity. So, the as-and-when frequency – or organic approach, as I call it – make for a better user experience. You talk to your subscribers because you have something to tell them, not because it’s the 1st of November. 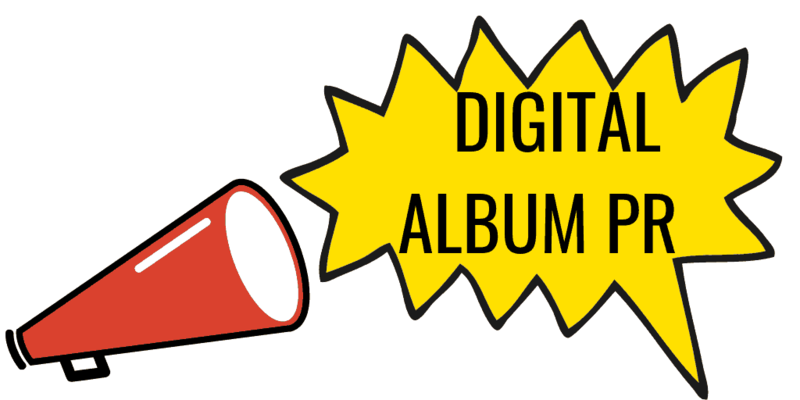 If an artist has lengthy lulls in their schedule – sometimes it’s just the rather eventless preparation for a new album or a longer teaching residency – it might be worth connecting with subscribers with a personal update or a friendly note. But good engagement can already come from a quarterly newsletter, depending on the format. I find segmentation much more important. Although I am aware that I don’t always do as I preach, if an artist is able to send certain tour dates only to subscriber segments who live in that region, it increases the overall user experience due to heightened relevancy of the message. It then allows for a different message to be sent to the remaining segment with other news or updates. For a musician with no management or representation, taking care of all these digital areas can be pretty overwhelming. If you had to prioritise and start work on just 2 small bits, what would they be and why? Focus on your name’s SEO (search engine optimisation) and take care of the platform that gives you the most immediate results. As sad as it sounds, this has been for a long time and still is Facebook. Concentrate on video content first and utilise its social channels (mainly YouTube and Vimeo). Since YouTube is Google owned, it adds greatly to search traffic, too. It’s also the first thing that will ring with promoters and agents who look you up. In terms of email design, have you tested between a simple text based style versus emails with photos? Which works better? 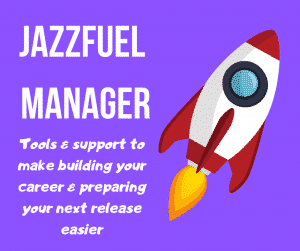 Something that you yourself have rightly pointed out on your awesome Jazzfuel website here, is that promoters and venues should always be approached with a personalised, single and direct email. It can contain images and links by all means, but I always send those communications from my normal email account and make sure it’s clear that I know who I am talking to. Email design comes into the equation when we want to inform, entertain and engage in the form of an artist newsletter broadcast or concert alert. That’s when a plain text email simply doesn’t cut it for me and when expectations amongst subscribers is a factor. 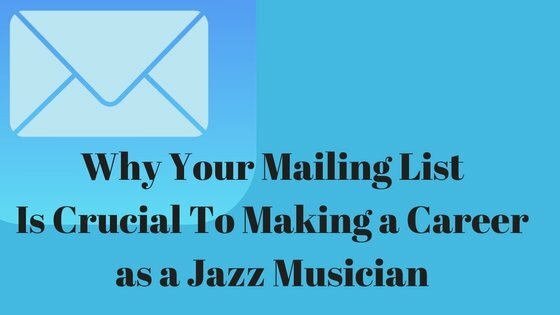 Different from the social channel, subscribers would never expect to get a mailing list email directly from an artist’s personal account. Email’s the channel where we are all used to seeing a somewhat branded, attractive and well designed, entertaining and informative piece of content: mobile responsive, compatible, personalised and – if possible – relevant to my segment. What’s your best tip for getting more fans to sign up to a mailing list on a musician website? Firstly – without digging too deep into the old marketing box here – it has to be a true value exchange. For my clients, the most sign-up success has always been with the prospect of getting exclusive insight (i.e. watch unpublished footage of the recording session), or promotional offers (20% off all downloads on our website). For one of my clients, we once had a super short 10sec thank-you video on the confirmation page, only accessible after sign-up. It pulled like an express train, until somebody made that video link public, which was pretty hilarious. Secondly – Making sure the email signup is “front of house” and obvious on the homepage – even at the expense of other content. In my experience, users tend to be more than happy to provide their basic contact details and subscribe, if they are invited to do so and find the signup form in the first place. Thirdly – integrate your subscription form into multiple places. Multiple place on your website, but also multiple places around the internet; mention your mailing list in tweets and link to the sign-up page every once in a while; publish links to the sign-up form in your video channel’s annotations; embed the form in an html tab on Facebook etc. As a retention and growth measure, make sure your website developer and email broadcaster have at least basic knowledge of the new GDPR (General Data Protection Regulation), which has just been changed and tightened, setting stricter rules for user data storage and permission control. Let your users easily unsubscribe if they so wish and don’t abuse your database with constant email blasts. That will help your reputation and keeps subscribers happy. When working on a musicians’ website, do you pull through things like gigs and audio from other sites (e.g. Soundcloud/Bandcamp/Songkick) and, if so, which ones are best for this? I tend to shy away from integrating and relying on too many external sources, simply because it means relinquishing control and depending on the longevity of a provider who might disappear all of sudden. Whenever possible however, I try to turn the table to push content from a website to a third party platform to increase connectivity and expand the artist’s reach. Since I am a passionate WordPress devotee and develop all of my artist sites on this popular platform, I keep looking for plugins that create feeds which speak to other sites and aggregators. AllAboutJazz, for example, have been using RSS feeds coming from Derek Hogue’s ingenious WordPress plugin GigPress (now owned by Modern Tribe) for years. WooCommerce and Easy Digital Downloads are two of the best eCommerce platforms around. They are both WordPress applications. Most data capture add-ons connect seamlessly with popular ESPs such as MailChimp, Exact Target and Campaign Monitor, to name just a few. The crucial point for me is to have a fallback and remain in control of the data in case of a platform disappearing or losing its feasibility. How do you help musicians ‘knit’ self-promotion into their everyday work? How important is it that this is done a) consistently and b) by the musicians themselves. That’s an extremely good question and an important point especially for the social media arena. The two types of personalities I deal with the most are those who feel slightly uncomfortable blowing their own trumpet and therefore don’t do it enough, and those who do it in excess. While the former tend to be the established artists with a sizeable catalogue and touring history to their name, the latter are mostly the young talents who have the confidence to self-promote frequently, but often miss the moment when it becomes too much and turns against them. As usual, the winning formula lies in the how. There’s no problem telling people about a new album, upcoming tour dates or announcing a major collaboration. But doing it from a personal, not a marketing, point of view is key. For an artist, sharing a soundcheck anecdote is so much more engaging than saying “playing at the Grand Ball Room tonight at 8pm. Hope to see you there”. Once the artist has found their personal public tone of voice, it is all about mixing self-promotion with other content. In the context of digital social media, this means regularly engaging with that chosen channel and its users, rather than using it as a one-way broadcasting tool. Beginning to make this discipline part of a weekly routine is indeed challenging. So, to answer your question, yes, consistently but within measure and in a relaxed and natural manner. And, yes, absolutely, an artist has to do the core part of it themselves. If you were a musician and had a budget of £400 to make a professional-looking video to promote your project, what would you spend it on? That’s an easy one to answer; I would most certainly invest it in the editing. Borrow a decent DSLR from a friend if you don’t own one. There is usually somebody who can film at a gig or soundcheck – maybe that same friend. Adding extra angles with fixed or even a wobbly smart phone can give some intriguing perspectives. Then make sure you get the audio as a file from the desk. That’s all. The magic happens in the editing. Cutting a video in an interesting way, ready to hit a nerve within a few seconds, is vital to get the desired attention. Indulgence and slow build-ups have their place, but unfortunately not in the medium we are dealing with here. Therefore it’s down to clever editing and rendering, ready for the right digital platforms that gets my vote here. Big thanks to Nadja of nadworks for this one! Through her company, nadworks, Nadja von Massow helps artists to focus on the music by supporting them in the key but often neglected digital areas such as website management, social media, digital asset creation and email marketing. She mainly works with established artists – Joe Locke, for example, is a long-time client – who have developed a marketable name for themselves and are known entities in the industry and with audiences. She then helps make sure they fully utilise their digital output to satisfy promoters, venues, record labels and the media with a prominent presence in that space.